The global oxidative stress assay market is expected to reach $736.85 Million by 2020 from $452.36 Million in 2015, at a CAGR of 10.25% between 2015 and 2020. 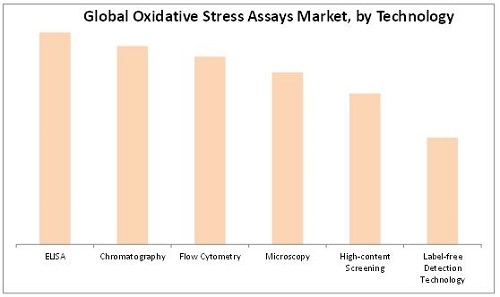 Factors such as rapid growth in the biopharmaceutical industry, strong trend of R&D investments in biotechnology and pharmaceutical industries, technological advancements like high-content screening for drug discovery, and government funding for life science research are driving the growth of the oxidative stress assays market. On the other hand, high cost of instruments and dearth of trained manpower for new and emerging technologies are the major factors restraining the growth of this market. This report segments the global market by product, test type, technology, end user, and region. The product segments included in this report are consumables, instruments, and services. The test type segments included in this report are indirect assays, antioxidant capacity assays, enzyme-based assays, and reactive oxygen species (ROS)-based assays. The technology segments included in this report are enzyme-linked immunosorbent assay (ELISA), chromatography, flow cytometry, microscopy, high-content screening, and label-free detection technology. The end-user segments included in this report are pharmaceutical and biotechnology companies, academic research institutes, clinical laboratories, and contract research organizations (CROs). 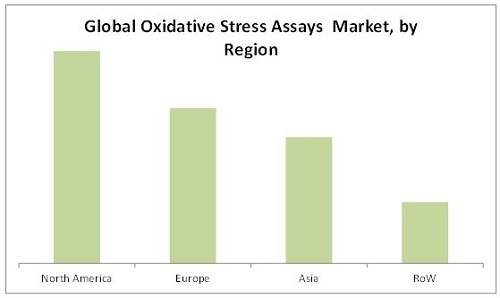 Geographic analysis reveals that North America accounts for the largest share of the global oxidative stress assays market in 2015. The Asian regional segment, on the other hand, is expected to register a double-digit growth from 2015 to 2020, owing to the expansion of leading oxidative stress assays companies and increased R&D spending. R&D spending in Asia increased from $158.94 Billion in 2001 to $329.31 Billion in 2010, at a CAGR of 8.43%. The R&D spending in Asia accounted for 27.13% of the global R&D expenditure in 2010. Major players in this market include Abcam plc (U.K.), AMS Biotechnology (U.K.), BioVision, Inc. (U.S.), Cell Biolabs, Inc. (U.S.), Enzo Biochem (U.S.), Merck KGaA (Germany), Oxford Biomedical Research (U.S.), QIAGEN N.V. (Netherlands), Promega Corporation (U.S.), Sigma-Aldrich Corporation (U.S.), and Thermo Fisher Scientific (U.S.). 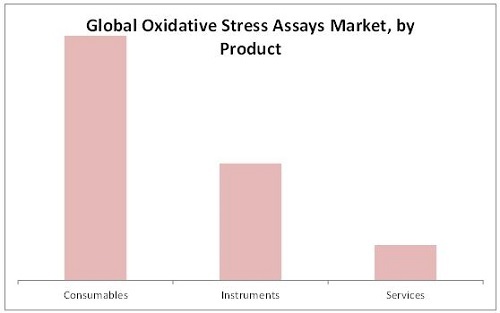 The global oxidative stress assay market is expected to reach $736.85 Million by 2020 from $452.36 Million in 2015, growing at a CAGR of 10.25% from 2015 to 2020. Oxidative stress assays is a well-established method for screening and detecting markers of oxidative stress in cultured cells. The assay kits gives more relevant biological information compared to that obtained by the measurement of individual components, hence it is a great tool for evaluating the capacity to counter oxidative stress. With rapid innovations in oxidative stress assays technologies, researchers are now able to detect oxidative stress biomarkers very easily. Furthermore, with rapid developments in the field of oxidative stress assays, researchers are equipped with new technological advances to generate high accuracy and efficiency in the testing of oxidative stress. 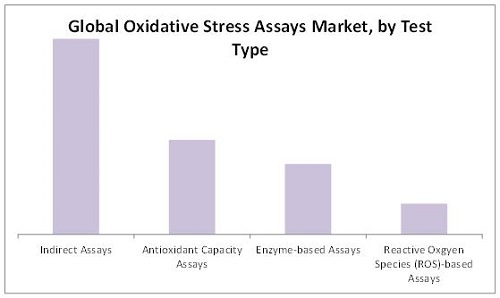 The report provides a granular understanding of the oxidative stress assay market. This report segments the global oxidative stress assay market on the basis of products, test types, technologies, end users, and regions. The product segments included in this report are consumables, instruments, and services. On the basis of test types, the market is segmented into indirect assays, antioxidant capacity assays, enzyme-based assays, and reactive oxygen species (ROS)-based assays. The end-user segments included in this report are pharmaceutical and biotechnology companies, academic research institutes, clinical laboratories, and contract research organizations. The regional segments included in this report are North America, Europe, Asia, and the Rest of the World (RoW). The report maps each test type and product segment in 11 geographic and regional segments. 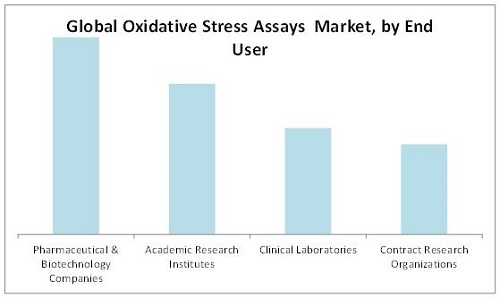 The major players in the oxidative stress assay market include Abcam plc (U.K.), AMS Biotechnology (U.K.), BioVision, Inc. (U.S.), Cell Biolabs, Inc. (U.S.), Enzo Biochem (U.S.), Merck KGaA (Germany), Oxford Biomedical Research (U.S.), QIAGEN N.V. (Netherlands), Promega Corporation (U.S.), Sigma-Aldrich Corporation (U.S.), and Thermo Fisher Scientific, Inc. (U.S.). 13.7 Thermo Fisher Scientific, Inc.
13.8 AMS Biotechnology (Europe) Ltd. Figure 86 Company Snapshot: Enzo Biochem, Inc. Figure 88 Company Snapshot: Qiagen N.V.